That’s more than a banister. It’s the banister you slid down on your first day of middle school before the bus arrived, and countless times after that. That mark on the wall has been there since you were a small child, and the living room in your home is known as the gathering place where friends and family congregate after evening meals. When you’ve occupied the same house for a while, or even if you’ve grown fond of your living quarters in a short amount of time, it’s likely filled with countless memories. And when it’s time to bid farewell to that place, those memories will flood your mind, making it that much more difficult to close the door for the last time. Here’s how you can make saying goodbye to your home a little easier. A picture isn’t just worth a thousand words — it’s priceless. Taking a photo won’t replace a memory, but it will help keep it alive and trigger a smile every time you pull it out of an album. You’ve probably taken photos over the years, but don’t be afraid to go through your home and take some snapshots of the places you’ve occupied. Saying goodbye to every room in your home seems a bit childish, but its effects could leave you walking away with some sweet feelings. Before you go, stop in to every room in your home and take it all in. “Remember that time when…” memories will often surface, and you’ll be left wondering where time has gone. Say goodbye and savor the moments you shared with this house. 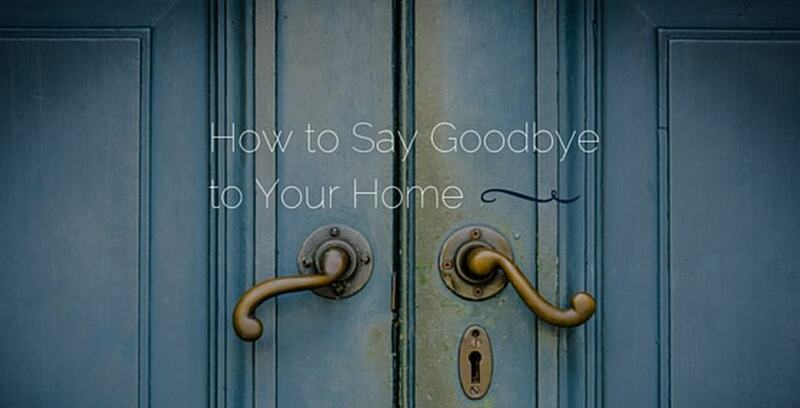 Perhaps everyone else would like a chance to say goodbye to your home, too. By having a house leaving party, you can celebrate the good times you had and end your time living there on a high note. This opportunity can be a good time to reminisce. You wouldn’t leave your home without the keys, and you shouldn’t bid farewell to your home without taking a small memento with you. It’s OK if you’d rather keep those memories alive in your mind, but taking a doorknob or something else small that has meaning could be a good keepsake. If you have the chance to meet the new owners of your home, take advantage of the opportunity. This will help you to know that the house is in good hands. It’s not being abandoned; it will be lived in by another group of people that will have their own family experiences. Perhaps they’ll also gather around the piano every Christmas, or have those board game nights filled with laughter. Or maybe they’ll simply fill the room with good conversation and good company. Those were some good times in that home, and now you get the chance to create even more in your new place. Moving forward doesn’t have to be bitter — it’s a time to start making new memories and a time to know that the place in which you live doesn’t have to dictate your happiness. It was there all along, and it’ll still be there — just in a different way. Are you struggling to keep track of all your belongings during a move, especially when you say goodbye to your home? Storage Direct can help. We offer secure, nationwide facilities for you to store your things until you need them. Contact us today to learn more!